No Choice - Fancy a Drink? We worked with the charity WaterAid to create a stunt that would raise awareness of its ‘No Choice’ campaign; to highlight the fact that many people in developing countries around the world have no choice but to drink dirty, unsafe water. We decided that shock tactics would work best, so we created a portable stunt using two standard office water coolers. WaterAid is an international charity that improves access to safe water, hygiene education and sanitation; greatly helping people and saving lives in the process. The charity, which was established in 1981, works with some of the world’s poorest communities in 27 countries around the globe. Our idea was to make the general public stop and think about how lucky they were to have access to clean drinking water; often a fact that is taken for granted in developed countries. We filled one of the water coolers with pure mineral water and the other with contaminated, dirty water. 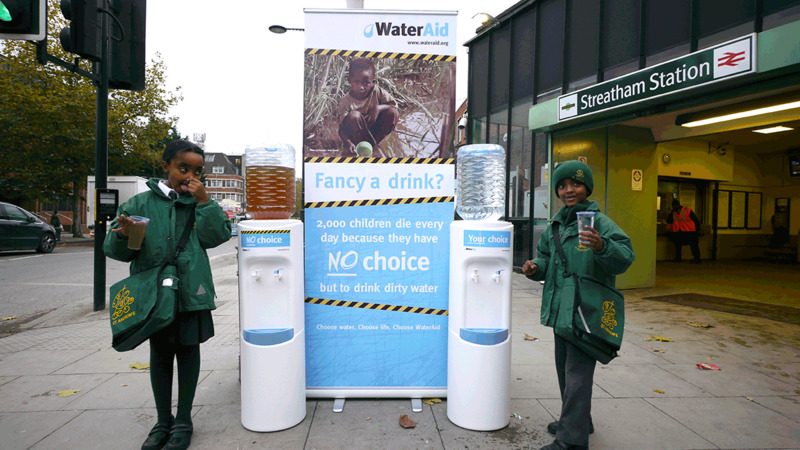 We took the water coolers on a tour in London, in the areas where WaterAid had a lot of supporters (City of London, Islington, Hammersmith & Fulham and Lambeth). We positioned them outside of tube stations and in prominent areas, like Liverpool Street Station. 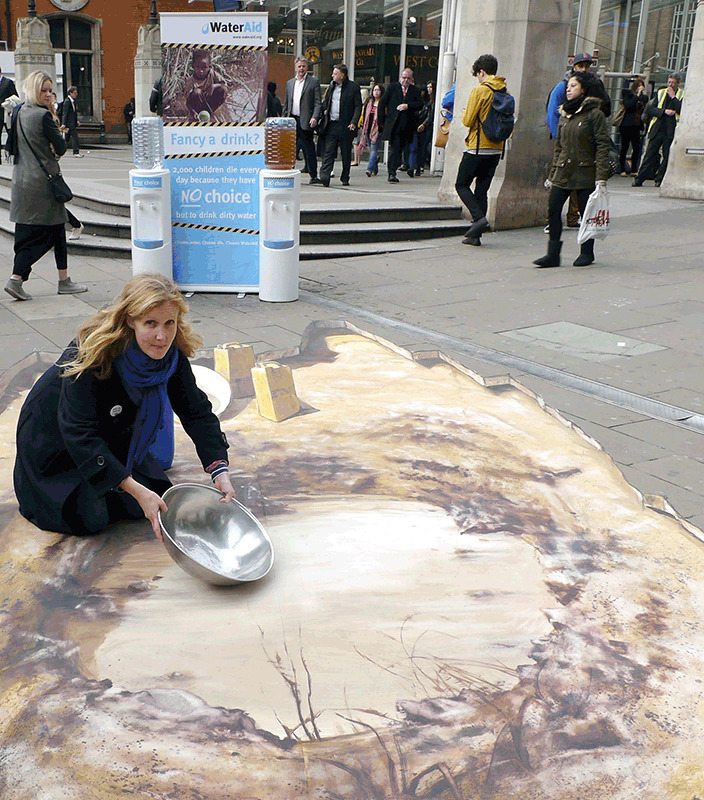 At Liverpool Street Station, the water coolers were accompanied by a 3D image of a dirty water source on the ground, to catch the attention of passersby. Commuters and members of the public were asked which water cooler they would choose to drink from; of course prompting the response that they would like the clean water and reminding them that some people in the world did not have the luxury of that choice. We also produced a banner to go alongside the WaterAid coolers, with key messages and branding on them to make the stunt more visual. We took some photographs of the water coolers in the different locations and sent these to the local media titles to generate regional coverage in London. The aim of the campaign was to only generate London-based media coverage for WaterAid. We created a press release about the stunt to send out along with the photos as soon as they were ready. We also informed journalists from the London titles that the stunt would be taking place, along with the local details, in case they wanted to go along and have a look or send their own photographers. We generated media coverage in the majority of the London boroughs that WaterAid included in the brief and helped to raise awareness of the campaign among existing and potential supporters of the charity. The coverage included titles such as Local London, Streatham Guardian, Fulham and Hammersmith Chronicle, London24 and more. There were many tweets about the water coolers on the day of the stunt and plenty of passersby stopped to interact. The stunt really made people stop and think about how lucky they were to have access to clean, safe drinking water whenever they needed.